The economy may relapse into recession, Central Bank of Nigeria (CBN) Governor Godwin Emefiele warned at the end of the Monetary Policy Committee (MPC) meeting in Abuja on Tuesday. Things are getting tough. How can we escape danger? According to him, the implementation of the 2018 Budget will prevent this from happening, writes The Nation's Collins Nweze. Barely a year after the economy came out of recession, in nearly three decades, another warning of a possible slip came on Tuesday from the Central Bank of Nigeria (CBN) Governor, Godwin Emefiele. It was a timely warning. 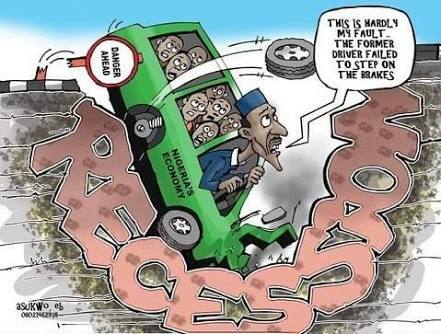 Emefiele’s revelation at the Monetary Policy Committee (MPC) meeting in Abuja, that the economy may return into recession due to the slow growth in the Gross Domestic Product (GDP) shocked many Nigerians. An economy is said to be in recession after contracting for two consecutive quarters. The economy slipped into recession in 2016. The economy declined to 1.50 per cent in the second quarter from 1.95 per cent in the first quarter of the year. Further decline is expected unless mangers of the economy adhered to the apex bank’s suggestions. But will the Federal Government listen to the CBN governor on the state of the economy, and possibility of it returning to recession, especially on the implementation of the 2018 appropriation? Emefiele warned that the euphoria that greeted the economy’s’ exit from recession may be under threat, expressing concerns that the modest stability so far achieved in key indicators, including inflation, exchange rate and reserves since its last MPC meeting in July – also appeared to be under threat of reversal, given the new data, which provided evidence of weakening macro-economic fundamentals. Emefiele said the implementation of the budget, the improvement in the security situation as well as sustained stability in the foreign exchange market will stabilise prices and strengthen economic growth. He said the committee believed, however, that accretion to the external reserves should strengthen the last quarter of 2018 with crude oil prices remaining above the $51 per barrel budget benchmark and oil production increasing to 2.23 million barrels per day. The apex bank urged the government to take advantage of the rebound in oil prices to strengthen the fiscal buffers. Speaking on the development, financial analyst, Michael Osita, said that improved access to foreign exchange, rising crude oil production and prices and upbeat in the manufacturing sector are signs that the economy is still on the right track. He, however, urged the government to take steps that will create more jobs and boost money flow to the grassroots. But, former President, Chartered Institute of Bankers of Nigeria (CIBN), Okechukwu Unegbu, said that as far as he is concerned, the economy never fully exited recession. He said what is needed presently is to create more jobs, support the growth of Small and Medium Enterprises, and keep inflation under control. “Economic growth is still low, and inflation rising. But diversifying the economy could help government achieve the desired growth,” he advised. He said that although there is an improvement in forex supply, there is more to be done. “There is still a lot of work to be done, including the states raising their revenue base”. A former Executive Director, Keystone Bank, Richard Obire, said the psychology underpinning economics is that if people had a positive outlook about the economy, they are more likely to invest in such economy. He, however, said the growth recorded in the economy was slim and that more must be done to sustain it. Obire said that the government should guard the economy from slipping into recession, adding: “Being out of recession, will lead to more investments, which in turn will trigger a rise in production and subsequently, job creation. The rise in jobs, he said, will lead to more income and subsequently, drive consumption and that consumption leads to better production because economic activities go in cycles. Saying the effects of the loss of jobs that occurred during the five quarters of the last recession are still there, so, is the high inflation rate, he insisted that now is the time for the people and economic managers to work hard to ensure the economic indicators get better. Emefiele said the committee identified rising inflation and pressure on the external reserves created by the capital flow reversal as current challenges. He noted that the inflationary measure has started rebuilding, and capital flow reversal has intensified as shown by the bearish trend in the equities market, even though the exchange rate remains very stable. The MPC, he said, expressed concerns over the potential impact of liquidity injection from the election related spending and increase in Federal Accounts Allocation Committee (FAAC) distribution which has risen in tandem with oil receipt increase. “The MPC however, called on the government to fast track implementation of the 2018 budget to help jump start the process of sustainable economy recovery and to facilitate passage of the Petroleum Industry Bill in order to increase contribution to the overall GDP”, Emefiele said. The CBN restriction on 41 items from accessing forex from official windows has also helped to resuscitate domestic industries and improve employment generation. More than two years after the policy shift, its objectives, such as encouraging local production of the affected items and boosting local industries, suffocated by the importation of competing products are being realised. The policy implementation was part of the homegrown solution, introduced by Emefiele, to sustain forex market stability and ensure the efficient utilisation of available forex to grow critical segment of the economy. This policy implies that, those who import these items can no access foreign currency through the official window to pay their overseas’ suppliers. Rather, they will have to source forex from the parallel market or Bureaux de Change (BDCs) to pay for their imports. The CBN chief said the bank has been developing home-grown policies to surmount challenges that confronted the economy in recent times. For instance, over the last decade, the CBN had invested over N2 trillion in funding agriculture, Small and Medium Enterprises (SMEs) and other manufacturers in the agriculture value-chain. Emefiele said assured that bank would continue to support operators in the agriculture, SMEs and manufacturing enterprises through its development finance initiatives, with a view to complementing the Federal Government’s efforts at diversifying the economy and ensuring that the nation is self-sufficient in food production. Speaking on the 41 items on Arise Television, Emefiele said: “The issue of those 41 items, unfortunately, is one that has been on my table. But, I think it is important that in the life of an economy, there is a need for us to take a look and ask ourselves: what are we really importing into this country? “When this thing started, we said, why should we import rice? Why should we import toothpick? Why should we import palm oil? At a point in this country, Nigeria was the largest producer and exporter of palm oil and we were controlling 40 per cent of the market share. Emefiele’s logic is that when items, such as palm oil, are imported, the local producers are made poorer.